For the second year in a row, Ignite has worked closely with Pepsi Max, Ford and M&C Saatchi to develop the concept and design behind the Pepsi Max FPR V8 Supercar livery. After initially meeting with Mark Winterbottom and Will Davison to discuss their ideas and inspirations, it became clear that the two drivers had very contrasting opinions when it came to art and design, as well as being very individual personalities. This realisation ended up being the foundation for the concept of ‘fire and ice’, with the cars being mirror images of each other, and each side tailored to that particular drivers’ liking. Much like fire and ice, Mark (Frosty) and Will are each a force to be reckoned with, and we look forward to following their progress in the V8’s this year. 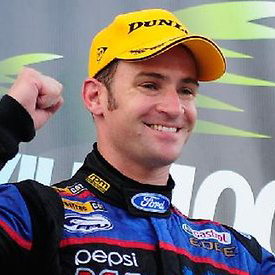 Will Davison - Two-time winner of Bathurst 1000.